I just discovered funny tea-related videos on YouTube. LOL. Videos, I haz ’em. Let me inflect them upon you. 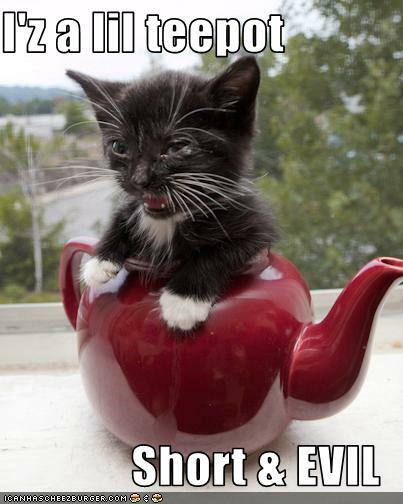 Yes, I have yet another cute kitty in a teapot post. Honestly, this might end up being a recurring theme if I run across any more. Unlike the plaintive little kitten of the previous post, this little fuzzball appears to have originated from the Mirror Universe. See the little goatee? No? I love tea about as much as a crazy lady loves cats. Tea Association of the U.S.A.